If you lead a small group, or are interested in possibly leading a small group in the future, this training session is something that will really benefit you! 9:15am- Session #1: Discover the Vision for Small Groups. In this session, Bill Donahue (Willow Creek) offers several inspiring images of what small groups can be. This session is meant to inspire leaders with an overall vision for the power of small groups. 10am- Session #2: Healthy Leaders Led Healthy Groups. In this session, we'll look at three different types of leaders and use Psalm 23 to explain what it looks like to be a good leader (shepherd). 11:15am- Session #3: Lead a Transformational Meeting. This session will touch on four elements of great meetings and offer a ton of practical advice for leading discussions. 1pm- Session #4: Build Authentic Relationships. This sessions explores how you can help group members feel comfortable opening up and sharing, feeling cared for, and experience spiritual growth. It's all about building relationships! 1:45pm- Session #5: When Groups Get Messy. This final session answers a lot of questions that leaders have, and touches on how you can handle things like spotty attendance, weird people, and even bad discussions. 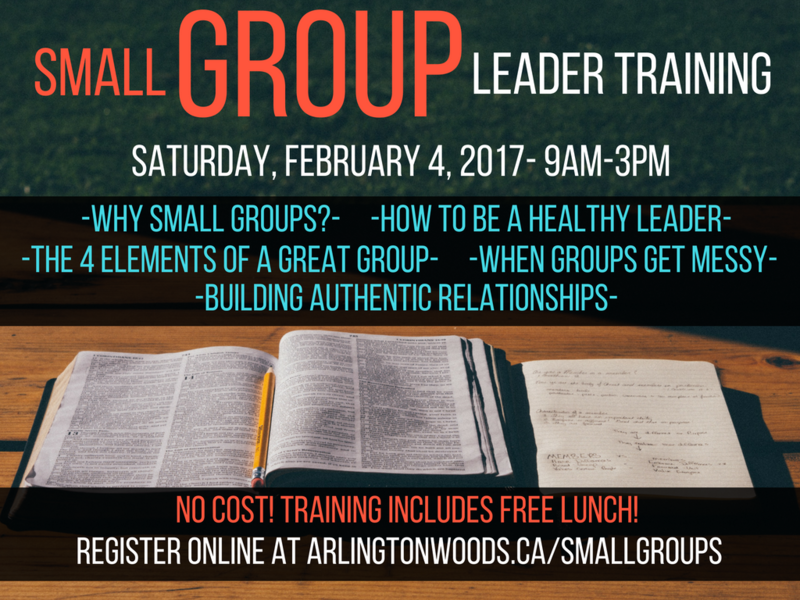 Yes, I am planning on attending the Small Group Leader Training workshop on Saturday, February 4, 2017 from 9am-3pm. We're planning on serving a pizza lunch! If you have any diet restrictions or allergies, please let us know here!